ST3 costs (22:39) Note: after recording, Sound Transit verified that the cost estimate applies to the representative alignment. We answer questions from the reader mailbag. From the archives: Is bike share good business? 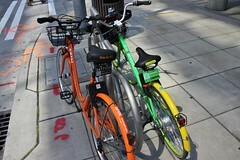 Within one month of Seattle imposing new regulations and a $50 per bike per year permit fee, Sarah Anne Lloyd reports that both Ofo and Spin are on their way out. Like with Ofo, which also recently announced its bikes wouldn’t be returning, a Spin spokesperson cited high permit fees as a deciding factor. If the companies are truthfully blaming the new fees, it would be a spectacular own-goal from the City. A light regulatory touch made Seattle into a dockless bikeshare success story. Taxing into oblivion the lowest-cost, lowest-impact transportation service imaginable while dumping cash into buses, trains, and cars would mock all the goals Seattle ostensibly has. However, Ofo is broadly retreating from the U.S., and Spin may pivot to e-scooters. Blaming regulators is a better excuse than “we ran our business into the ground.” So readers can choose to believe the best or the worst about what SDOT and City Council wrought. Regardless, never fear: JUMP (Uber) and Motivate (Lyft) are not deterred by exorbitant permit fees ($). Though the city’s recently passed bike-share regulations allow up to four companies to operate up to 5,000 bikes each, only three applied for permits. The application period recently closed. Apologies for the audio quality on my end… Skype wasn’t cooperating.